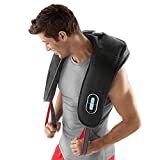 The Brookstone Neck and Shoulder Sport Massager, as the name suggests, caters mainly to athletes and other active people. A tough workout can leave muscles aching and sore, and a deep massage from a massager like this one can make a difference in recovery. This device specializes in shiatsu, which is a Japanese form of deep tissue massage that promotes healthy circulation and stimulation of blood vessels and muscle regrowth. Choose from three speeds, a vibrate function, and more, all independently of one another. The Brookstone model makes it easy to get your relief and get back to working out. The Brookstone Massager has quite a few features and benefits that are worth discussing. Let’s take a look. The Brookstone massager has three different intensity settings: light, medium, and intense, allowing you to choose how vigorous you want your massage to be. All of the settings are somewhat powerful, but the difference between them is noticeable. You should start out with the light setting first to get your body used to it, but you can work up to more powerful settings as needed and with medical supervision. In other words, make sure your doctor or coach says it’s a good idea. The massager has a U-shaped body that fits around your neck to get the most massaging action to your upper back, spine, and shoulder blade areas. To hold the unit in place, you can use the included straps that allow you to let your hands rest. If you want to use the massager lower on your back, lift your hands to shoulder height and let the pad work on your lower back. It seems that it works best with the neck and shoulder area, as you’d expect. The Brookstone massager includes a heating element, which benefits the muscle recovery process by stimulating blood flow and relaxing muscle tissue. The heating element only has one setting, which is why the programmable timing cycles for the massager exist. The heating element has to be turned back on manually at the beginning of each massage cycle, but you should be careful about overusing it because you could get burned. Pay attention to the signals your body is giving you. You can connect the straps at the front of the massager, so it stays on your back without you having to hold the straps. This makes it well suited for getting a healthy post-workout drink or snack while you get your massage. The strap is secured with Velcro, so it stays tight around your body and is easy to remove. The Brookstone massager includes three preset programs: soothing, pulse, and energizing presets. By setting up the massage preset to your liking, you can achieve a variety of benefits to your health. You can set the ball nodes in the back of the pad to roll and vibrate along your spine, creating a soothing sensation across your entire back. You should be careful when using any massage tool on your spine; using too much force could cause nerve damage. As with any product designed for an athletic customer, this massager has heavy-duty cloth wrapped around it so it can last you for years without needing a replacement. As long as you follow the manufacturer’s instructions, you should have little to no problems. The massager plugs into a standard 110-volt wall outlet, ensuring that it has plenty of power to give you the best massage that you deserve after a long day. The cord is 10 feet long, so you don’t have to feel chained to an outlet. The biggest unique feature of the Brookstone massager is the independent vibration function, which can operate alongside the percussive massaging nodes. Vibration massage works by stimulating the nerves in the affected area to the point at which it dulls the pain. It also increases blood flow and lymphatic fluid flow to stimulate recovery of damaged muscle tissue. The relaxing sensation generated by a vibration massage triggers the release of serotonin and other endorphins into the bloodstream. These two neurotransmitters induce feelings of happiness and relaxation. These feelings are the ultimate goal of any massage. Although this is an excellent massager for its purpose, it has a few drawbacks. The first one is that it is intended for people who prefer a more powerful massage than the average. There isn’t an actual “soft” massage. This is deep tissue massage and vigorous massage at that. Another drawback is the heating pad. This heating pad can get very hot very quickly. If you don’t pay attention to the time you spend wearing it, you can get burned. If you get burned with a massage pad, rinse your back or shoulders with cold water and discontinue the use of this product until it heals completely. You should also avoid bypassing the automatic shut-off timer for the heating pad because it’s put in place for your safety. Use only the preset limits and prescribed time to get a proper massage from the Brookstone. Third, the massager might be unwieldy or bulky for some people. It consists of a U-shaped body that, while perfectly suited for draping across the back, doesn’t lend itself well to other areas. If you experience pain in other areas like the legs, calves, or feet, you’ll need to check out a different product for relief. The other factor that contributes to the Brookstone’s unwieldiness s its weight. This is a large massage pad that weighs about 5 pounds. That can feel like a lot of weight to be hanging around your neck. You should use the handholds to make it less strenuous. Finally, the massager’s control settings aren’t in a good spot. They’re placed on the back of the neck. If you lean on the buttons, it can be easy to switch the time accidentally. The idea is to set a program speed and let the massager work. We prefer massagers that have the controls within easy reach. This is an excellent choice for massage treatment tools if you’re someone who doesn’t mind extra power, but if you want gentle, you’ll need to consider other options. The three settings provide noticeably different sensations and benefits, but again, the intensity might offset these benefits for some people. It does well what it was designed to do: provide a deep, powerful, and stimulating massage for the upper and middle back and shoulder blades. It works moderately well for the neck. We’d advise keeping it limited to the shoulders. OVerall, it’s a good product for what it does, but outside that skill set not as useful. We prefer something a little more versatile, a tool that can multitask rather than unitask at a single thing. This would mean you’d have to have multiple massagers for different areas of your body. If you just need something for the shoulders, this is one of the better options.